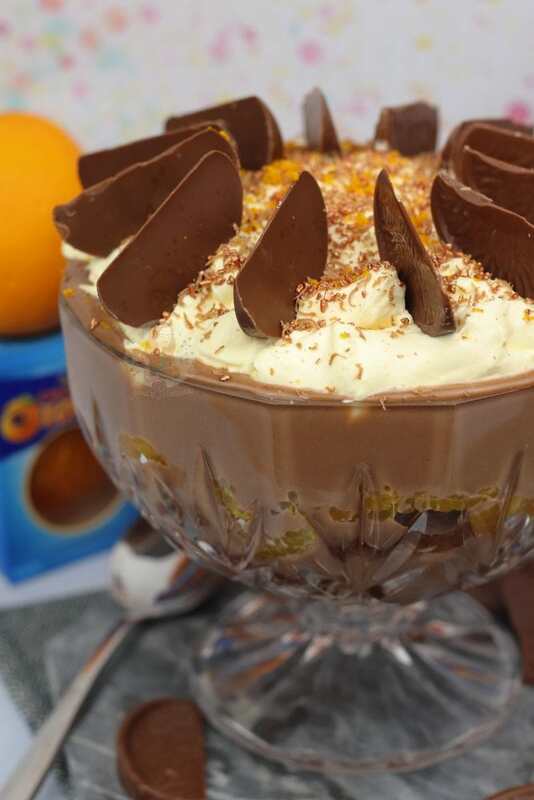 Easy and Delicious Terry’s Chocolate Orange Trifle, perfect for the Festive Dinner Table. Ohhh Terry’s… how I love thee. 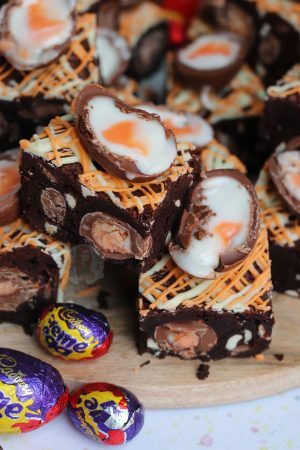 Honestly, how many Terry’s Chocolate Orange recipes can one girl have on her blog?! I believe this is my sixteenth?! But I just can’t get enough. After posting my Terry’s Chocolate Orange Layer cake a little while ago, I wanted to do yet another and another and another. The addiction is real. The only issue is, just like Mint Chocolate, that it’s not everyone’s favourite treat. I will even admit to not liking all Chocolate orange things! I utterly adore Terry’s, love the Lindt Truffles, but that’s pretty much it. I’ve yet to find a Chocolate Orange Hot chocolate that does taste too acidic or like Tangerine. Melting a Terry’s and adding milk sounds more like it. However, as its well and truly the festive season, with less than a month till Christmas, I thought I would bring out the big guns and post this bad boy. A truly decadent and DELIGHTFUL dessert for the festive season. 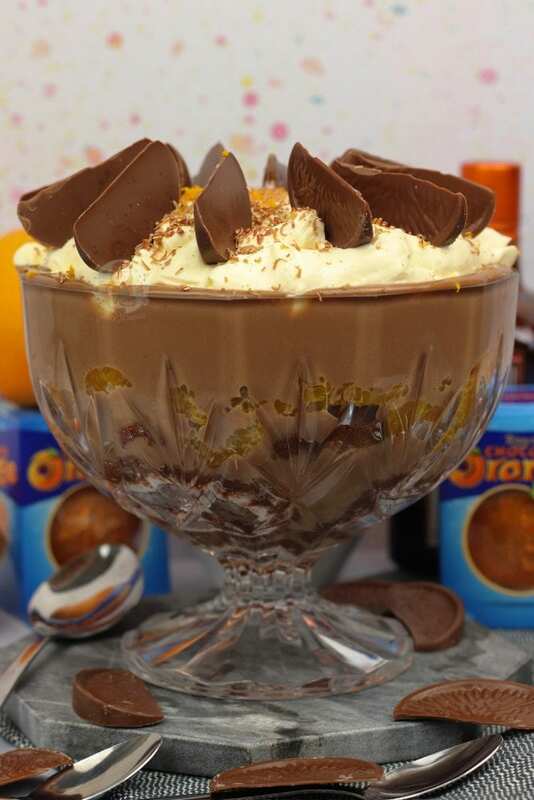 A Terry’s Chocolate Orange Trifle recipe. Oh boyyyy I am in love. In reality, there isn’t actually that much terry’s goodness inside, but there’s enough on top. 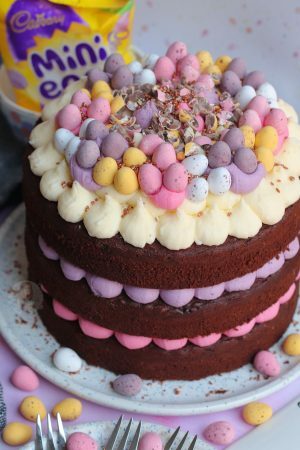 When making a chocolate cake, if you add in a good quality orange extract it makes the most delicious flavour. This is different from buying a chocolate orange treat if you’re wondering, as in cake form things taste different. I love a good chocolate orange sponge, and this is no different. 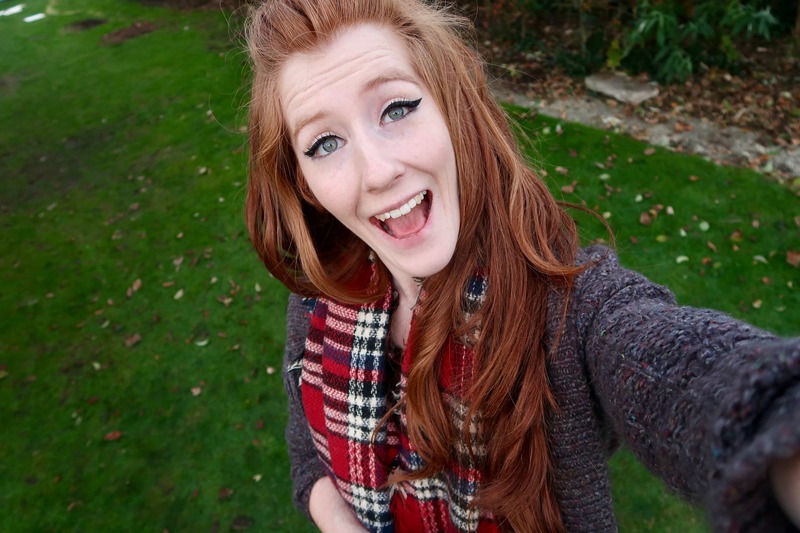 To make it easier in this one though, I used a lot of ready-made bits and enhanced them you could say. Using a ready-made swiss roll for the sponges, made it pretty and DELIGHTFUL. Soaking slices of the sponge in Cointreau and juice from a freshly squeezed orange made them gooey and tangy. The Cointreau is entirely optional but definitely makes it more of an adult dessert. 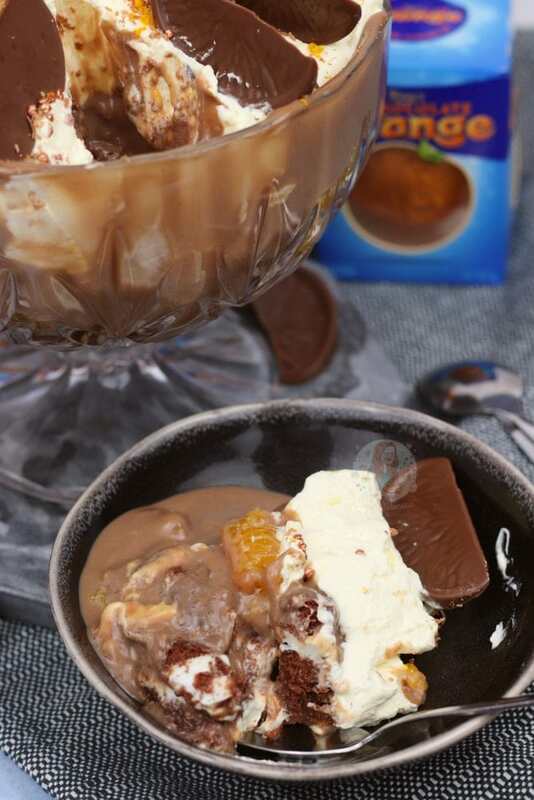 Similarly, using ready-made vanilla custard but adding in melted Dark Terry’s Chocolate Orange made it incredible. 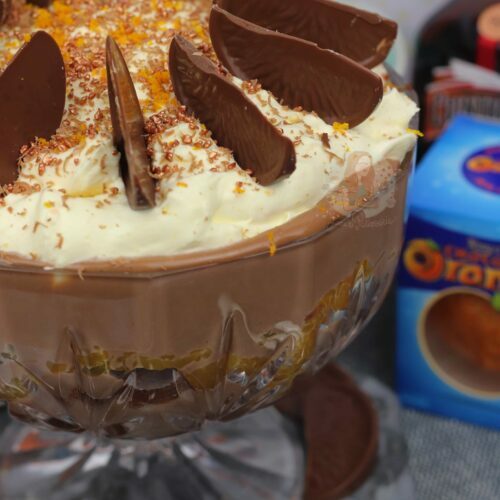 I did wonder if the Chocolate Orange custard would work because of the orange extract inside the chocolate, and when I added the melted chocolate to the custard it went horrible lumpy, but melting it briefly for 20 seconds or so, it was PERFECTION. 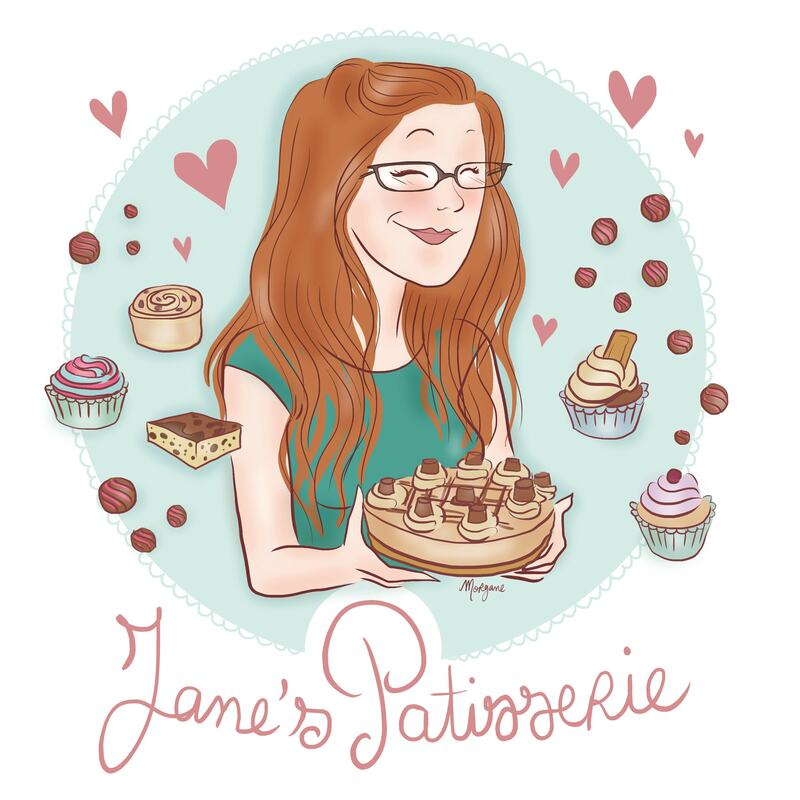 I’ve never wanted to smother all of my desserts with anything else. Honestly, makes me want to make my Terry’s Chocolate Orange Layer cake again just to smother a slice in the custard. The whipped cream has a smidge more Cointreau in, with some orange zest, making it slightly tangy but not too much. Slices of actual orange in there as well, without the rind, give an extra ‘wet’ element which sounds disgusting when you say it like that, but as in most trifles, there is something similar. I’m yet to really enjoy a classic trifle to be honest, as something like this completely takes over my preferences. 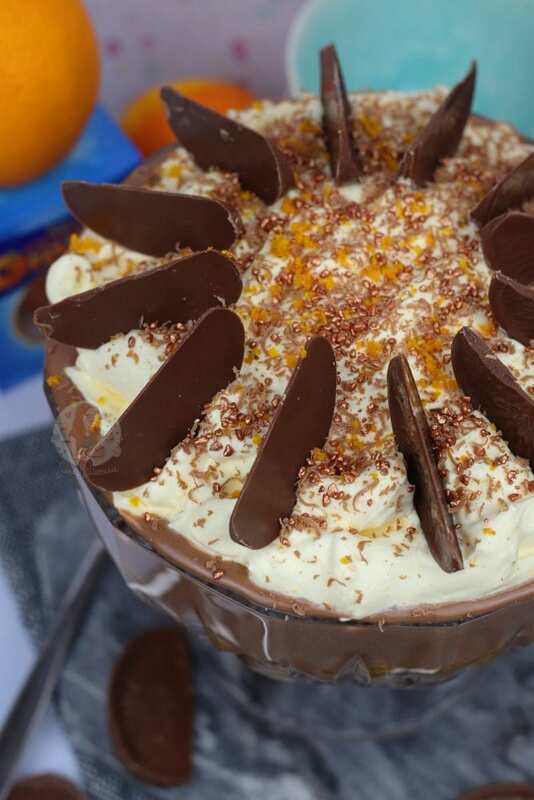 Decorating this bad boy with the whipped orange cream, gratings of chocolate and of course oodles of Terry’s slices makes it glorious and incredible to look at. The careful placing and layering make it look good, and isn’t technically required, but how good will that looks on the table?! Honestly, this one is INCREDIBLE and I know I say that with all my recipes, but I truly believe it! Enjoy! 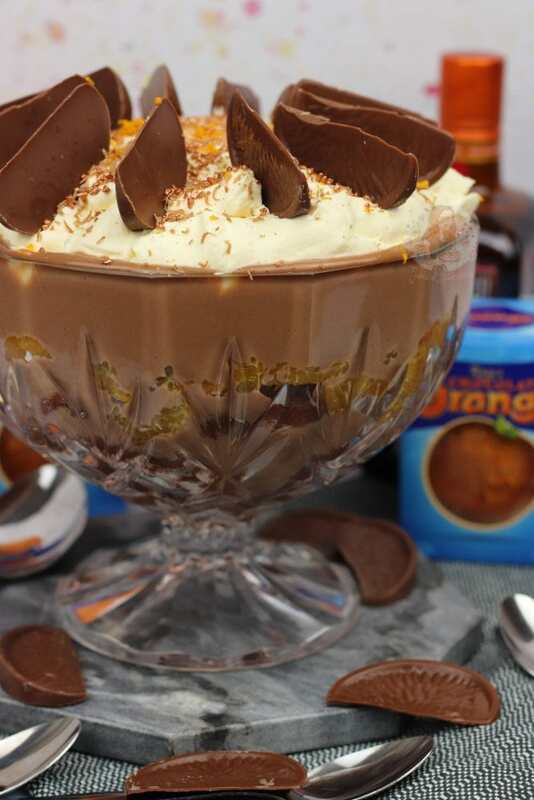 Easy and Delicious Terry's Chocolate Orange Trifle, perfect for the Festive Dinner Table. Melt your Terry's Chocolate orange carefully till smooth. 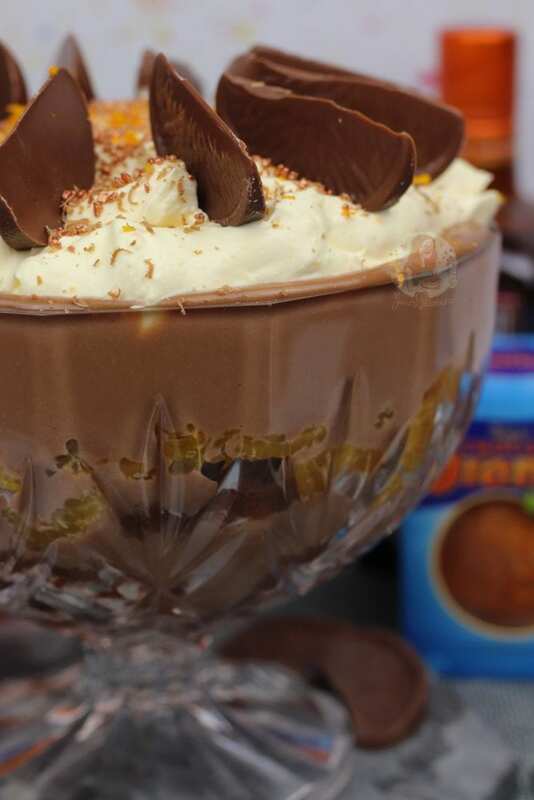 Pour your ready made custard into a bowl, and add in the melted chocolate. Mix together till smooth. If it goes lumpy, heat the custard mix in a pan over a low-medium heat and stir till all smooth and lovely. Add your double cream to a bowl, add 2tbsp of Cointreau, the icing sugar, and the zest of the orange and whisk to soft peaks. Slice your Chocolate Swiss Roll into 1-2cm size slices. Sprinkle over 3-4tbsp of Cointreau, and the juice from the orange. 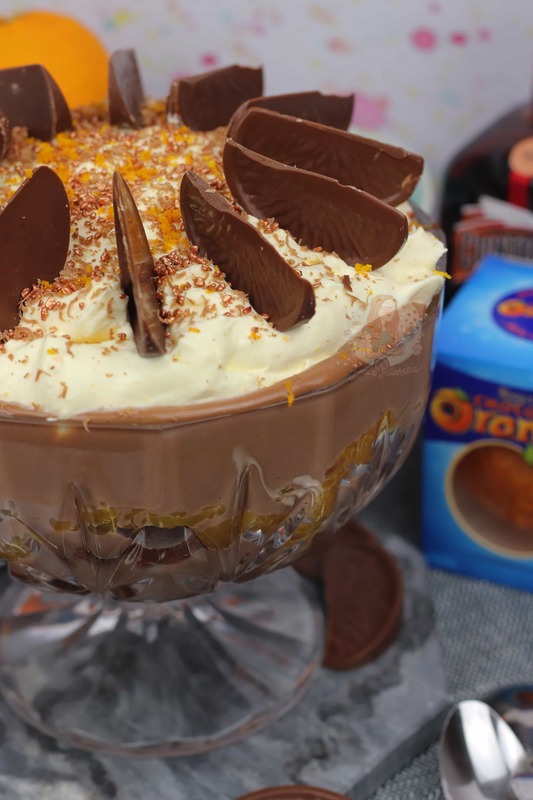 Start building your trifle - I put the slices of the swiss roll around the edge of the trifle bowl at the bottom, and a few on the bottom as well. 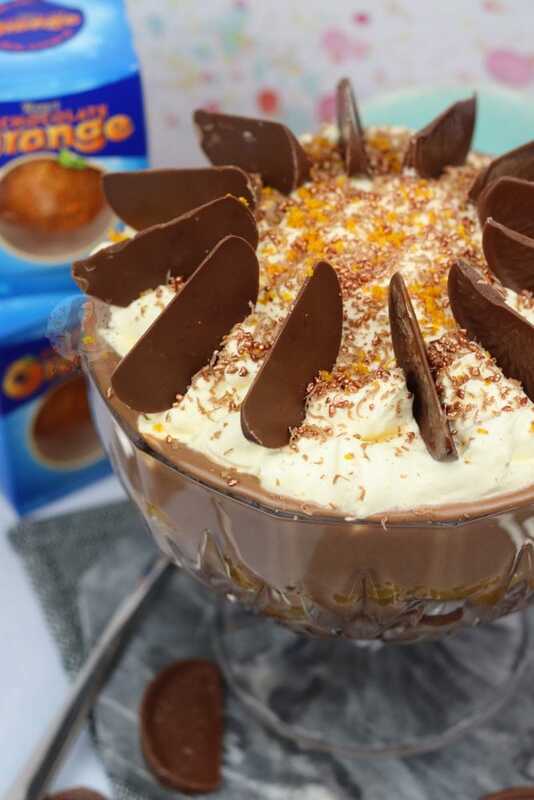 Pour over half of the Chocolate Orange Custard and spread. Add on the slices of Mandarin from the tin, and add on any more swiss roll if you have any. Pour over the rest of the custard. Spread over the top the whipped orange cream, and decorate with anything you fancy. I used Terry's chocolate Orange slices, grated chocolate, and some extra orange zest along with some festive sprinkles. Leave it to set a bit in the fridge so the custard isn't as runny. Enjoy! 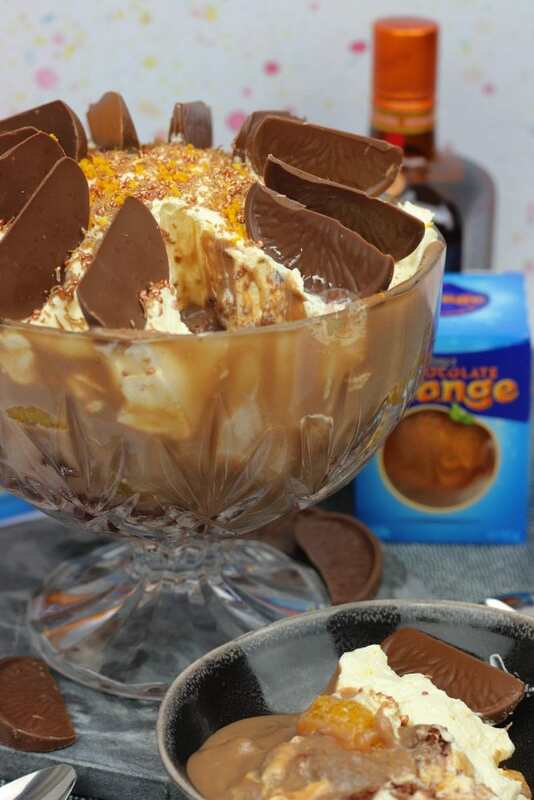 You can swap the Terry's Chocolate Orange for normal Chocolate if you wish! The Mandarin Slices can be slices of orange from the fresh fruit, or you can use the liquid from the mandarin tin in place of the fres orange juice. 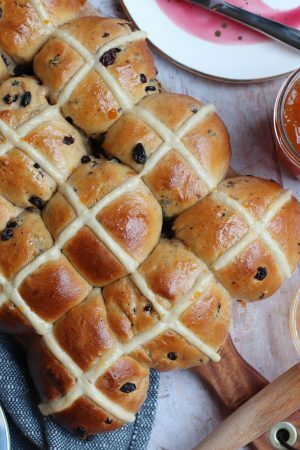 This will last for 3 days once made, but is best eaten fresh. The cointreau is entirely optional, but can be replaced with more juice from an orange if you want it alcohol free. Older Next post: White Chocolate Raspberry Rolls! I really want to make this for Christmas.. what size glass bowl did you use? and where can I get one please? I used a crystal glass trifle bowl from my fiancés mum, but I believe its about 1.25l in size?! I’m unsure!